I was deeply saddened to read of Judge Gaines’ death in Sunday’s paper. It had been several months since I talked with him at the Clarke County Courthouse. He was in a mellow mood. We discussed changes in the practice of law and particularly the new GA Child Support Guidelines calculations. Joe Gaines was still practicing law when I began practicing in 1970. He was City Attorney for Athens and a very good trial lawyer. I had a couple of cases with him back then. He was an excellent trial lawyer. He was always a gentleman and a professional. In the late 70s the Western Circuit was allotted a second judgeship. Joe Gaines was a popular choice of many but he really did not “politic” for the job. He felt it to be unseemly. At that time, I was President of the Western Bar Association and Foy Horne was President of the Athens Bar. We worked together to poll the Bar Associations on preferences among the several candidates. The “election” was held in the Office of the Clarke County Probate Court and Foy Horne and I held the polls and counted the ballots. Peggy Hartmann was Probate Chief Deputy then and chatted with us as we held the polls all day. We had advertised it as a confidential poll and the votes or results would not be published. It fell to me and Foy to go to Atlanta, I believe the Capitol City Club, and meet with the Judicial Qualifications Commission and present the results. The Commission welcomed the input and engaged us in conversation about the Bar results. Years later Judge Gaines teased me about not telling him how many votes he got. However, the recommendation of the commission was representative of the local Bar’s preferences. Judge Gaines was a knowledgeable Judge and a firm one. I told his family that he made me (and many others) angry on several occasions (as Judges can do) but I developed the highest respect and affection for him. As County Attorney and as Commission Chair, I interacted with Judge Gaines on numerous occasions. I tried several cases before him. I won some and lost some. However, I had the utmost faith and trust in him and always respected his decisions. On December 30,1996, Judge Gaines presided at the Swearing in ceremony for me and other Oconee Officials at the Courthouse Annex on Georgia Highway 15, then serving as the temporary courthouse during renovation of the Courthouse in downtown Watkinsville. That was my last oath taking and I treasure the picture that now hangs in my law office. He also spoke at an Appreciation Dinner for me in early 2000. He was very kind and sincere in his remarks. He was always encouraging and supporting in what he knew to be a tough job. As an attorney, I had an appreciation for the court system and space needs not shared by many other local elected officials. On matters involving the Court, we always conferred - he was then Chief Judge. During my time as Chairman I sent a newsletter to citizens providing detailed information on county affairs. Judge Gaines and Judge Barrow were on my mail-list. Over the years, they both called me and discussed the Report and expressed support and encouragement to me. Judge Gaines became a mentor and friend. Along with many more, I will miss him.I am thankful that our paths intertwined for many years. Our community is richer for his service and legacy. 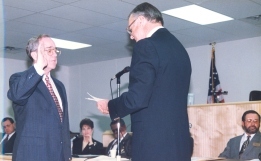 On December 30, 1996, Superior Court Chief Judge Joseph J. Gaines administered the oath of office to incoming Oconee County Officials at the Government Annex Building on Georgia Highway 15 and then serving at temporary courthouse. In the photo, Judge Gaines is administering the Oath to Wendell Dawson, as Chairman of the County Commission. Others in photo from L to R:Probate Judge David Anglin, Clerk of Superior Sandra Glass, Sheriff Scott Berry and Commissioner Albert Hale. For more than half a century, Joe Gaines worked to make sure the judicial system in Athens, Clarke and Oconee counties worked in the most fair and equitable manner possible. The Elbert County native served as a private and city attorney in Athens for 23 years before being appointed in 1976 to serve as a Superior Court judge for the Western Judicial Circuit - a job he held until his death Saturday at the age of 79. After 26 years as a Superior Court judge and then as chief judge of the Western Judicial Circuit, which hears felony cases in Oconee and Clarke counties, Gaines entered semi-retirement in 2002. However, he retained the role of a senior judge for the circuit and was called to try cases when his expertise was needed. Among attorneys and judges in Athens today, Gaines was known as a mentor whose impeccable knowledge of the law and integrity embodied the way the judicial system was meant to operate, said Western Circuit Superior Court Judge Lawton Stephens. "He had the ability to boil a problem down to its basic elements," Stephens said. "Sometimes, you have attorneys come in who want to talk around the problem and shift the focus. But he had a way of finding exactly what the heart of the issue was and would try to help people solve their problem -- to find some resolution. "He never lost sight of the fact that the courts are there to serve the people, and that's how he operated. No matter who you were or what your station in life was - rich or poor - if you came before Judge Gaines, you were going to be treated fairly. That's what he was known for." Gaines oversaw many cases through the years, from sensational murder trials to tense civil lawsuits. He treated each case with the same attention and scrutiny, but his skill as a judge became crystal clear during the hardest cases, said Athens attorney Ed Tolley. "Those large cases can be difficult to handle," Tolley said. "You have to know the case inside and out, be able to corral the lawyers, make sure they behave, take care of the witnesses and balance the rights of the victims with the rights of defendants with the interest of the public. There's a lot to take care of. He was excellent at balancing it all." Former District Attorney Harry Gordon, who tried several cases against Tolley in front of Gaines, agrees. Gaines ran a tight ship in the courtroom and it enabled him to give cases the extra scrutiny and consideration he was known for, Gordon said. "We watched our conduct in his courtroom," he said. "He didn't allow a lot of foolishness - from either side or from the people being tried. If a lawyer was missing the point with a particular witness, or if a witness' answer was less than clear or less than truthful, he wouldn't hesitate to ask his own questions." He never settled for a watered-down version of the facts, Gordon said. It was that persistence and skill that earned Gaines the admiration of those who came up after him in the legal community, said Steve Jones, who serves as a judge in the Western Judicial Circuit today. Jones tried cases in front of Gaines as an assistant district attorney at the beginning of his career. "When you were in Judge Gaines' courtroom, you needed to be prepared because Judge Gaines was going to be prepared," Jones said. "He wanted you to be prepared and he wanted to see you give it everything you had - both sides. He liked to see that. My time in front of him made me a better lawyer and eventually a better judge." Both Jones and Stephens claim Gaines as a mentor. He introduced them both after they were sworn in by Gov. Zell Miller in the early 1990s. Jones still has the speech Gaines read that day, framed and hanging in his office. "When I first was appointed as a judge, he used to bring me into his courtroom to watch," Stephens said. "He'd pull a chair right up next to his chair on the bench. It was like they were trying cases in front of two judges. Anytime I had any kind of question, he'd stop what he was doing to help me find the answer. He was that type of person." Former Athens Mayor Upshaw Bentley began practicing law just before Gaines joined the bar in 1953. Over the years, he worked with Gaines in his role as city attorney and always valued the high standards Gaines set for himself. "He was an extraordinarily fair man of the utmost integrity," Bentley said. "He never played favorites. He just followed the law and he had great understanding and knowledge of the law. He's had a profound impact on Athens; he was an unusually fine judge." Outside of the courtroom, Gaines was an avid historian and naturalist. He knew Elbert County and its history like the back of his hand, said longtime friend Peggy Galis. One of the oldest militia districts in Elbert County was named for Gaines' family, but his interest in the past didn't stop there, she said. "He wasn't just interested in, or proud of, his own family's history. Although he should have been very proud, he was interested in the entire history of Elbert County and the entire area," Galis said. Funeral services for Gaines will be held at the First United Methodist Church in Athens at 2 p.m. Monday. There will be a viewing at Lord and Stephens, West today from 5 to 7 p.m. His family requests that those wishing to remember Gaines make donations to the Leukemia and Lymphoma Society, the University of Georgia School of Law or to New Bethel Church in Elberton. One of my last official actions as Chairman of the BOC was to testify in a lawsuit (Maynard Vs. Oconee Count and City of Watkinsville) over a challenge to our sewer policy of not providing residential sewer service. The case was decided in the County’s favor after I left office on December 31, 2000. WATKINSVILLE -- A judge's recent ruling upheld Oconee County and the City of Watkinsville's stance to restrict the county's sewage capacity to commercial and institutional use. Superior Court Judge Joseph Gaines ruled in favor of the county and city in a lawsuit filed in October by Athens developer Paul Maynard, who claimed the two governments illegally deprived him of a sewer permit for a proposed apartment complex near Main Street. Oconee County Commission Chairman Melvin Davis, who inherited the lawsuit from the previous board of commissioners, said the legal action could have had precedent-setting ramifications had the ruling gone against the county. Oconee County historically does not grant sewer permits to residential developments but limits them to commercial and institutional purposes, including schools and government-funded facilities. County officials feared that, if Maynard won the case, a flurry of sewer-permit requests for apartment complexes would be filed and there would be no way to stop them in court. Officials also feared granting permits for residential use would limit treatment capacity needed for attracting businesses like Wal-Mart, which plans to locate a ''supercenter'' on Epps Bridge Parkway this year. Maynard had the proper multi-residential zoning to build his planned five-acre, 36-unit Watkinsville Courtyard Apartments at Harris Lane off Third Street near downtown Watkinsville. The dispute was whether the county could legally deny sewage capacity for the complex. The county contended that its Calls Creek sewage treatment plant, which can handle 100,000 gallons of sewage per day, did not have the capacity for the complex. Maynard's suit alleged that, not only does the county have enough capacity, but that the county showed favoritism in granting permits for commercial developments over residential developments.